Know exactly where to send direct mail pieces to hit the right demographics. Know how many direct mail pieces to print. Save money on postage fees. Local streets, major roads, and highways shown. Map dimensions will vary between 2'x2' and 3'x3', depending on the ZIP Code chosen. PDF format maps are delivered within 1 business day via online download for 1 full year. See all of the streets in your ZIP Code on this clean map with accurate and detailed street labeling. Quickly find streets and neighborhoods using the parks and lakes provided (where available) for reference. Identify detailed ZIP Code boundary information easily. Beat your competition by relying on the best postal and street data in the industry, provided by TeleAtlas, and updated monthly and quarterly respectively. Is the boundary of the ZIP Code shown? 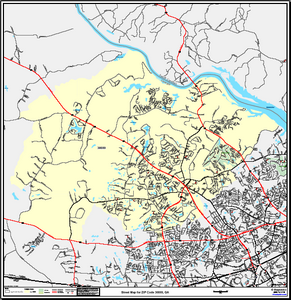 Yes, the boundary of the selected ZIP Code is outlined and highlighted for ease of use. Surrounding ZIP Codes are also outlined and labeled appropriately when available for perspective. Yes, all streets, roadways, and water boundaries are included for the selected ZIP Code as well as the surrounding area. This gives you a clear perspective of the area being targeted and how it fits into the larger city around it. Carrier Route are groups of addresses assigned by the USPS to aid in speedy mail delivery. These carrier routes are 9 digits - 5 numbers for the ZIP Code + 1 letter for the carrier route type, + 3 numbers for the carrier route code. For example "32504R001" or "90210C007." Typically, each carrier route is related to where a particular mail carrier delivers. Do carrier routes follow ZIP Codes or cross boundaries? Each carrier route is defined as a small part of a ZIP Code. The full 9 digits of the carrier route code (e.g. 12508C007) is a unique code that represents each carrier route, is a part of a ZIP Code and therefore cannot cross into a different ZIP Code. What is the difference between a carrier route code and a ZIP+4 code? ZIP+4 codes and Carrier Routes, while each having 9 digits are not the same thing. ZIP+4s are groups of houses, usually on of side of a street block grouped together for mailing purposes. Carrier routes contain tens or hundreds of these ZIP+4s organized in an order that makes for efficient mail delivery. What does the first letter in front of a carrier route label mean? Is there a difference between R001 and C001 - does the R or C designation affect my ability to direct mail to these areas? Carrier routes can be sub-characterized as city, rural, PO Box, or highway contract routes - each based on what kind of delivery mechanism is used. The letter at the start of the carrier route number indicates the sub-characterization. The designation "R" denotes a rural delivery carrier route where mail is delivered via automobile. A "C" designation means that it is a city delivery route, where mail is delivered on foot by a postal service employee. The designation "B" indicates that is "PO box delivery". These carrier routes cannot be mapped by mapping firms because multiple labels overlap significantly. Regardless of the sub-characterization, all postal discounts allowed for mailing by carrier route will apply. While these letter-based designations can give you some idea of the density of occupants to expect in any given carrier route, they do not limit your ability to send direct mail. Who normally mails by carrier route? Any business, organization, or political campaign that wants to reach the majority of household in a local area should sort mail by carrier route. Can I get a carrier route code appended to my address file? What is CASS? All major direct mail campaigns should be running the address files through an address standardization process known as "CASS," following strict USPS guidelines. Even non-saturation mailings should be CASS certified prior to mailing to ensure the maximum delivery. CASS checks the addresses against a USPS file of deliverable addresses, corrects any typos in your address file, appends the ZIP+4 and carrier route codes (along with some other codes not relevant to this discussion). Your list provider should always run the list against a CASS process before giving it to you, but your lettershop or other service bureau can CASS your existing customer database for you. You can also use carrier routes to target new customers. The specifications below describe the PDF map you would receive. We believe you should know exactly what to expect when you order a map from Area-Codes.com. A sample is available on both this page and the samples section of this website. If you have any questions, please contact us. * The map will include local streets, major roads, and highways. * The selected ZIP Code will be highlighted and labeled. * Lakes and parks will also be shown where available for reference purposes only. * Streets will be dark grey with labels in dark grey. The street data is based on the latest quarterly release from GDT Incorporated. Although this nationwide data is updated frequently for the highest accuracy available, we cannot guarantee that any particular street will be on the map. * Map will be optimized to ensure a high degree of labeling for the local streets. However, we cannot guarantee that any particular street will be labeled. * Highways will be labeled with the appropriate highway shield and number. Exit points, where available, will be labeled. * The map legend will include symbols, colors, and labels for all map elements. Area-Codes.com reserves the right to modify colors as appropriate to achieve the best cartographic representation. * Each map will include branding logo information and any applicable copyright notices. Any duplication, digital or paper, in whole or in part must retain this information. * The map will be provided via e-mail in PDF format and/or as a printed map (depending on your order choice). Map size will vary between 2'x2' and 3'x3', depending on the ZIP Code chosen. If you plan to print this yourself, be sure you have access to a wide-format plotter.